Andrew joined MHBC in 2018. He provides a range of urban planning services to public and private sector clients including policy reviews and analysis, obtaining development approvals (Subdivisions, Condominiums, Site Plans, Official Plan and Zoning By-law Amendments), project co-ordination and management, and undertaking special studies and associated research. Prior to joining MHBC Andrew has previous work experience with the public sector at the regional and local level, and with the private sector in land development. 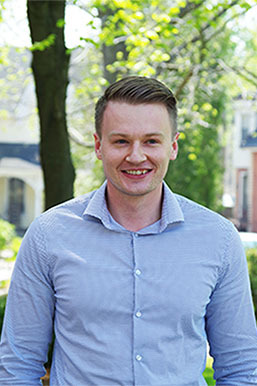 Andrew completed his undergraduate degree from the University of Waterloo and received his Bachelor of Environmental Studies Honours Co-op Planning with a minor in Geography and Environmental Management and Diploma in Environmental Assessment in 2018.